Northern Irish number plates are permitted to take part in the cherished transfer scheme. All Northern Irish number plates contain an "I" or "Z" with the letter combination typically representing the county the registration originated from - for example, Enniskillen originally allocated "IL" marks. Our collection of cheap Northern Irish number plates contain many marks originally issued by DVA. The DVA (Driver and Vehicle Agency, Northern Ireland) in Coleraine was the equivalent authority to DVLA, Swansea. After July 2014 control over all registrations was passed to the DVLA. Northern Irish number plates are permitted to take part in the cherished transfer scheme and are perfectly legal on G.B. vehicles. Registration marks issued in the Irish Republic are not transferable. Cheap Northern Irish number plates consist of up to four numbers combined with up to three letters. There are eight licensing areas in N.Ireland: Belfast, Enniskillen, Downpatrick, Ballymena, Coleraine, Londonderry, Omagh and Armagh. The first letter in three letter combinations indicates the year of manufacture, the remaining letters indicate the area of issue. For example, Enniskillen issued 'IL' plates - 'AIL', 'BIL', 'CIL', etc. Belfast was allocated 'AZ' - 'AAZ', 'BAZ', 'CAZ', etc. As can be seen, cheap Northern Irish number plates often lend themselves to the formation of names, e.g. 'DAZ', 'SIL', 'WIL', etc. In addition, cheap Northern Irish number plates, in effect, can "cover up" the year of manufacture on DVLA registered vehicles. Imagine a smart Mercedes Benz registered with a 'MBZ' plate. However, the main attraction of cheap Northern Irish number plates is simply what it says on the tin - they're cheap. We can offer registrations from as little as £136. 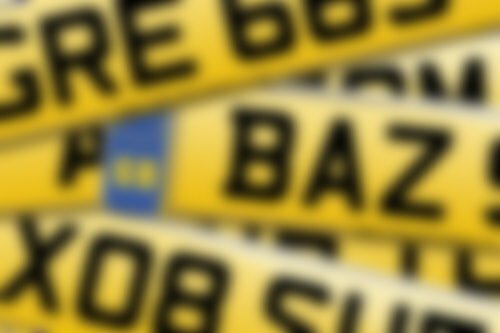 We have a vast choice of Northern Irish number plates - go ahead and search or give us a ring on 01642 363738.